Sig Scott did not have any formal art training. He delivered ice for his father as a young man and supported himself and his family for thirty-five years as an engineer for the Pacific Fruit Express in North Platte. 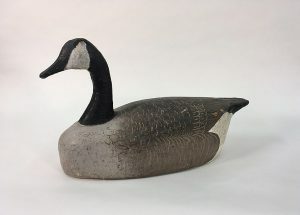 Today decoys are considered a folk art, but it began as a necessity for Scott. He hunted a time when the use of live call birds were newly outlawed and most major decoy producers had gone out of business. Scott found his own solution. Throughout the 1940s and 50s, with the help of his wife Ruth, Scott hand made more than 500 decoys in over twelve different positions. Many collectors consider Scott’s decoys the best made in Nebraska though finding a original might be difficult as he rarely sold them.